TestPattern.org: Who is Timothy Geithner? I got my hair cut at a place near Union Square today during lunchtime. I told the girl who cuts my hair that I planned to head over to San Francisco Centre afterwards, to eat lunch and check out the pre-holiday shoppers. She said, "It's going to be interesting to see what Black Friday is like around here." Black Friday is next week. Biggest shopping day of the year. Union Square is one of America's top shopping destinations. This Black Friday will likely be one of the worst in decades, if not in several generations. It should come as a surprise to no one, as consumer spending has been on the decline since the beginning of the year. After my haircut, while I was eating lunch at Panda Express in what is essentially an upscale mall, I read the top Yahoo stories on my Palm Treo. I learned that Timothy Geithner would be President-elect Obama's Treasury Secretary. Geithner worked for Kissinger and Associates in Washington, D.C., for three years. Geithner served as Under Secretary of the Treasury for International Affairs under Treasury Secretaries Robert Rubin and Lawrence Summers. Geithner is President of the Federal Reserve Bank of New York. 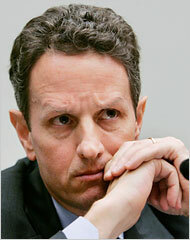 Geithner is a member of the Group of Thirty, which includes Paul Volcker and Paul Krugman, among other noteworthy financial experts. Geithner has been referred to by the New York Times as "center-right... the ultimate pragmatist.. neutral... no liberal... keeps his ego well in check. He asks a lot of questions." Geithner is the "seasoned public servant" who, along with Treasury Secretary Paulson and Federal Reserve Chairman Bernanke, has made "all the key decisions" regarding recent government actions taken with Fannie Mae, Freddie Mac and AIG. Geithner is credited for having "engineered the rescue of failing investment bank Bear Stearns." He supposedly "strongly disagreed" with Paulson's proposal to move "day-to-day bank supervision out of the Fed." The stock market rose after Obama's selection of Geithner to be Treasury Secretary was announced. Geithner's nomination injects some certainty into the markets, analysts said. Wall Street was concerned that additional financial rescue efforts would be on hold until the new administration was in place. The appointment of Geithner could speed the process, said Christopher Low, chief economist at Memphis-based FTN Financial. "It is not just that Geithner is solid and qualified," Low said. "The market has lost faith in [Treasury Secretary] Henry Paulson. The fact that there is finally someone else we can turn to in this crisis is a godsend." Someone else we can turn to? Does this so-called expert whom the Post cites not realize that Paulson and Geithner, with Bernanke, have been working, and some would say failing, together? If the market has lost faith in Paulson, why would they feel any differently about one of his colleagues? Along with Mr. Paulson and Mr. Bernanke, Mr. Geithner has come under criticism for the original construction of the $700 billion bailout plan, which had to be overhauled and has so far failed to remedy the financial crisis. Associates say Mr. Geithner is an independent, though he was a Republican when he first was a staff member at the Treasury Department in the late 1980s under Presidents Ronald Reagan and George Bush. Is this the kind of change that Barack Obama promised us?